Art Matters: How Does a Picture Mean? Remember I said that asking “how” will get us closer to the picture’s meaning than asking “what.” We don’t want to know what a picture means, we want to know how to uncover its aesthetic meaning, because that is what the artist recorded: a visual aesthetic experience. If so, we can go on. On a 102 degree day, with gray smog blurring William Penn, and the Philadelphia streets baking in the sun, I made my way to the Late Renoir exhibit at the Philadelphia Museum of Art. On the way, I saw graffiti, litter, and swathes of grass burned brown. Perhaps it was the heat, because very few people were there. “A good day to see the exhibit,” the cheerful ticket taker told me. I asked for the headphones. Later, in the bathroom, I listened to two women discussing how impressed they were that Renoir, crippled by arthritis, continued to paint. For an objective aesthetic analysis practitioner, all of this piqued my interest, so I did some more research. Holland Cotter, writing in the New York Times, said Cassatt “had the clearer eye” than Matisse. She said of the same pictures that they were “the loveliest nudes ever painted.” (“Avant-Gardist in Retreat,” June 17, 2010). First of all, we have to move past the subject. If we are to appreciate this work, we must experience it aesthetically. Only then will Renoir’s subjects transform into visual ideas teaching us new ways of seeing. What, at first glance, seems like a world far removed from our smog-filled, sun-blasted steaming streets then can become one rich with new possibilities of adventures in perception. Let’s try to uncover the aesthetic qualities in Woman Tying Her Shoe. Composed of swirling pillows of such color chording richness the eye becomes inebriated at first glance. No matter where you look, you become bewitched by nuances of rose, yellow, ivory, tan, and blue. Violette de Mazia used to say Renoir painted as a bird sings, and his singing here seduces and enraptures. The figure becomes a central solid but light- in-weight mass of linear light-in-color strokes, glowing rosy (skin) tones, and golden (hair) highlights. The hair swirls into at least three concentric circles establishing a donut-like mound, and this circularity repeats and becomes balanced by the figure’s backside—donut rounded again and planted in the small chair. Similarly, the mass to the figure’s right, the mass behind her head, and the cushion on the floor repeat the theme. In the unit to the left, the color units fan out and encircle the head creating internal clover patterns, then subdue on the floor unit and background wall into muted strokes of syrupy pastel tones. 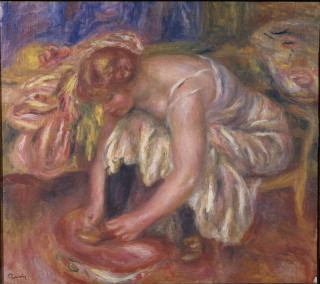 Renoir transforms a simple, everyday activity of tying a shoe into a color rondo illustrating his ability to fuse all the plastic means (color, light, line, and space) and illustrative details into a blend inseparable from decorative patterns. Each volume floats into colorful space and is an organic part of the delicate, variegated color units. Only a few paragraphs, but I hope you can see how my understanding of this picture’s aesthetic quality differs from the descriptions I quoted from the catalogue and headphones. My description is of the picture, not about it. I described the visual meaning in what Renoir expressed in terms of his medium—color—and based on its aesthetic qualities as well as its visual qualities: richness, glow, luminosity, etc. We learn how to see by doing this work. For example, most of this past summer I remained trapped in my house because of the heat. One day, to alleviate my boredom, I happened to look out the large sliding glass door in my basement into my backyard. Yes, the air was steaming with heat. Yes, the grass looked burned brown and thin. Yes, the trees’ foliage seemed enervated, sagging, as if exhausted. Then, as though I sharpened the lens of a camera, something shifted: I saw the round pot of red New Guinea impatiens; I saw the birdbath and three finches drinking from it; I saw the bank of woods. The trees’ foliage separated into volumes of deep greens and blues reaching forward, creating pockets of lavender space that echoed the round birdbath and the circularity of the flowerpot. The coasters of red flowers led me to the path which pushed back into the deeper woods. Islands of luminous light hovered in the heat, pulsing forward and separating from the tree trunks and the foliage. Renoir taught me how to see this. That is why I look at pictures. That is why I do this work. In the next post, I will describe why artists must tell lies. Driving west down Lancaster Avenue, I passed Route 320 and saw mums planted in front of Wilmington Trust (I think) on the right. There were many colored mums but the bright yellow ones caught and excited my eye and those were the ones I really noticed as I drove quickly by, while the others- rust, park purple, and copper- melted into the background. There was no pattern to the placement of mums; the yellow mums were placed hit or miss but I noticed all of them. Now when I look at the paintings, I first notice what color shapes attract my eye. What areas did the painter paint that color as my eye moves round the picture plane? What other color shapes attract my eye eye and where are they? As you have said, it is no accident where the artist put the colors, shapes and line to create the composition and space. The gardeners put the yellow mums in the edges haphazardly; an artist carefully plans the placement of his colors.